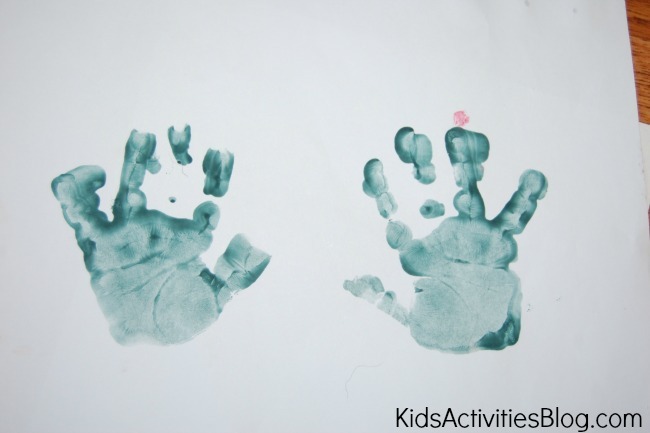 A handprint craft makes for a fun project for kids and a special keepsake for mom. 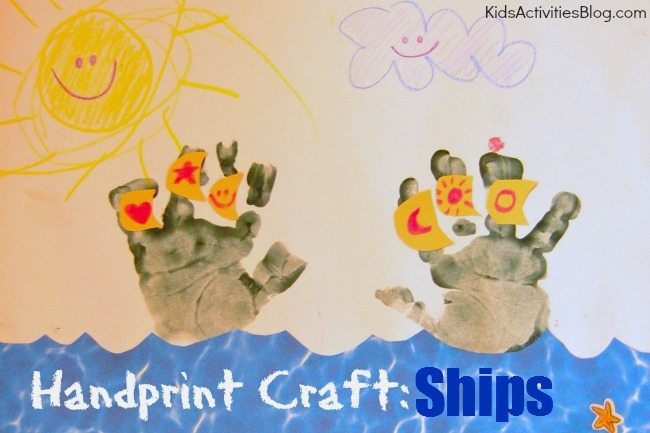 Check out this cute way to make ships out of your child’s handprint. Almost once a weekend we enjoy a nice relaxing family day at the beach. We like to go to the private beach, because it is quieter and when it is quieter, we get to see more wildlife. There are also several ships, (since we normally go to the beaches on the naval station), which Rory loves to see. After we got back from the beach we were still talking about the big ships on the beach, so we decided to make boats of our own with a fun handprint craft. We chose to use a bluish-black paint to make the handprint ships. I made sure Rory knew that to make the ships she needed to spread her fingers spread far apart. 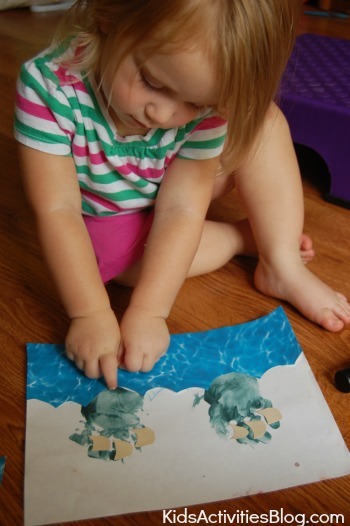 When your little one's hands are filled with paint, have them press their hands in the middle of your paper. After we made the handprints, we used the opportunity to count her fingers. It is just a good way to add counting to your day! Once the hand prints are dry you can cut the paper to make the water. To cut the paper, I measured the bottom of the handprint on the paper so that I could cut the right waves. 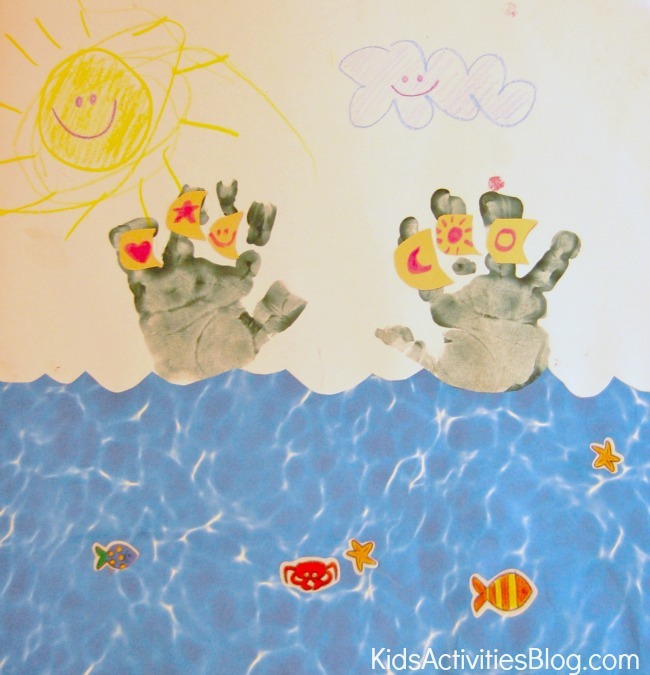 I placed the water paper on top of the handprints and then made a little pencil line, like a tracing.  I traced the bottom angle of the handprint to make sure I cut my wave in proportion to the ships. Once you have your water paper, glue it underneath your boat. Using white paper, I cut out almost a large, exaggerated D  shape for sails on the ships. I asked Rory if she wanted to draw anything on the sails and she said hearts, moons, stars and circles. When we finished with the sails we placed sea creatures in the water. This was by far Rory's favorite part of making the ships, (besides rubbing paint all over herself). When we were done, we went back through and counted all the sea creatures we placed in the water. On a few of these we added suns and clouds, on some we wrote Come Sail Away With Me,  and mailed them to her grandparents. We love our ships! This is adorable! What a fun craft this would be for Columbus Day!